The Istanbul Technical University (ITU) –SUNY Information Systems Engineering program is run by ITU and Binghamton University. It has been admitting students since 2003. 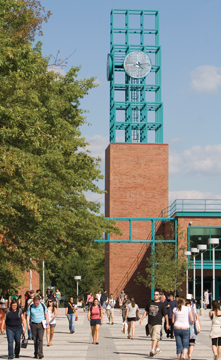 Students will complete their first and third year at ITU, and the second and fourth year at Binghamton University. Upon successful completion of the program, students receive a diploma from both ITU and Binghamton University. This is a 4-year, multi-disciplinary engineering degree program. The medium of the program is English. To begin their studies, students must receive a minimum TOEFL score of 83 IBT (or an equivalent score from another internationally recognized English exam). Those who cannot achieve proficiency in the language are to attend a preparatory program in English at ITU. Students are allowed up to 2 years to complete the preparatory program. The payment is to be made in TL currency while studying at ITU and in US Dollar while studying at Binghamton. Registered students take ITU courses at the ITU Maslak Campus (Istanbul) and take SUNY courses at Binghamton University (Binghamton, NY, USA).